Plumbers and heating engineers are highly skilled professionals who need to know their stuff; and they’ll play a crucial role in making your project a success. Traditionally, plumbers were involved in anything to do with metalwork on site – which is why skilled trades may still be found on a roof completing flashings or flat coverings in lead. Similarly, their remit used to include the guttering, back when it was all installed in cast iron. These days, a lot of this work is taken on by roofers and carpenters, but some plumbers still offer this service. Another area where you might typically see crossover between trades is where the above-ground drainage (waste pipes etc within the structural envelope of your property) meets the underground pipework. Installation of the latter is usually completed by the groundworker. It’s worth knowing that underground drainage is typically supplied in a brown colour, whilst internal waste pipes are either grey or white plastic. • Approved Document F – Ventilation for all matters to do with mechanical extraction, heat recovery, passive stack ventilation, warm air etc. 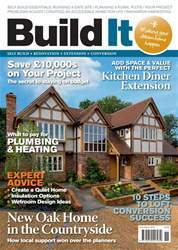 Build It magazine’s November issue is packed with detailed practical advice & inspiring projects to help you create your dream home. Here’s a taster of what’s inside: •	Stunning eco renovation (page 54) •	How to get loft conversions right (page 64) •	What you need to know about insulating your home (page 70) •	10 design tips for wetrooms (page 85) •	Save money by getting your project budget right (page 100) •	How to get planning permission in the countryside (page 106) … and more!